American Tigers Martial Arts has been serving the Weston community for over 10 years. American Tigers Martial Arts Weston offers a wide variety of martial arts classes including Tae Kwon-do, cardio kickboxing, after school kids programs and adult classes for the serious martial arts enthusiast. We also offer private lessons and special teams such as Master Club, Sparring Team, Poomsae Team, and Black Belt Club for elite students to compete in state and national competitions. We take great pride in offering the most complete martial arts classes in Weston. Our classes are a great source of cardiovascular health, weight loss, and rigorous exercise. Self-defense is a major part of our philosophy and we are trusted to equip our youth to be a part of the anti-bullying campaign being supported by our school system throughout the Weston community. Karate is a mindset that implores discipline, not only physically, but mentally as well. Discipline is the main foundation of all that we do, and our martial arts programs are designed to teach your child to become goal-oriented as they climb the ranks of martial arts achievement! American Tigers has chosen to use the Tiger as its symbol and logo, because it’s such a rich part of the Korean folk tale and history. At present South Koreans call the peninsula Hanguk, while North Koreans call the peninsula Choson. South Korea divides itself politically into nine provinces and six special cities. North Korea divides itself politically into nine provinces and three special cities. The Korean peninsula is about 600 miles long, but at its shortest width (near the DMZ), it is only 120 miles from coast to coast. 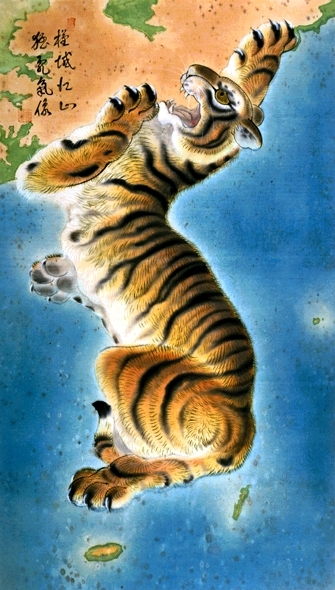 Many South Koreans, especially younger ones, describe their peninsula as “tiger-shaped.” The tiger is a traditional symbol that drives away misfortune, but it also represents the urban and aggressively successful modern South Korean economy. The embroidered breast patch on the court attire of military officials includes tigers and leopards, both symbols of valor and courage. Tae Kwon Do is the national sport of Korea, and the Tiger is the national animal of Korea. Along with that we chose to use the stars and the color scheme of our nations red, white and blue to create our logo. Thinking through our logo was important to us, because it needed to symbolize unity of our nations coming together within this discipline called Tae Kwon Do. We wanted our logo to represent strength, dignity and character. The world has become a global melting pot, and hence it has the fortune of collaborating traditions, disciplines and history that represents this sport, as we see it.